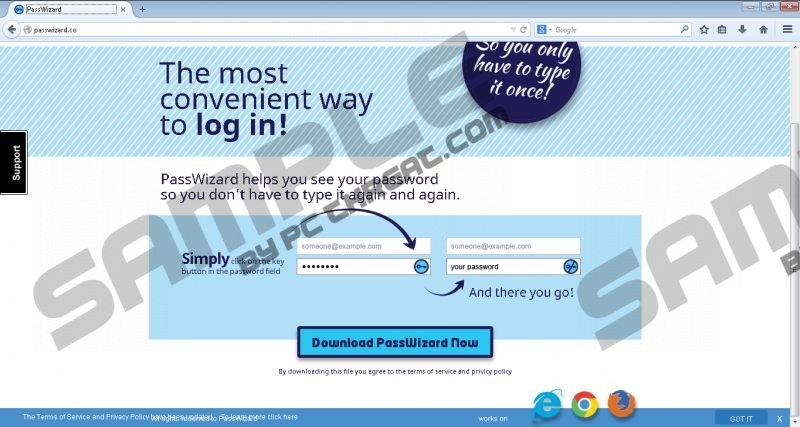 PassWizard is a tremendously suspicious browser application. On passwizard.co it is presented as a tool which supposedly offers the most convenient way to log into virtual accounts, when in reality it is just another ad-supported application. The program supposedly works on Internet Explorer, Mozilla Firefox, and Google Chrome browsers; however, it cannot be downloaded from the official website. Unfortunately, in most cases this program travels bundled with DomaIQ installers, which are infamously linked to PassWidget, BlockAndSurf, PassShow, Re-markit, and other advertisement-supported programs as well. Continue reading to learn all you need to know about PassWizard removal. Even if you are not intimidated by the risks of private data leaking, you still should not trust the application because it has been designed to evade removal. There is no doubt that you should not face any difficulty with the removal of authentic software, which means that PassWizard is not as reliable as you may have believed it to be. Note that authentic applications would not change their names either, and PassWizard can be presented as PassWizard-soft, PassWizard Corp, di5PassWizard, v01PassWizard, etc. Even though this is a trick to make it more difficult to delete the undesirable application, you certainly have a chance to remove it. Since PassWizard can be updated every few weeks, it is important to use authentic and up-to-date security software to ensure the successful automatic removal. Of course, you can delete PassWizard manually as well; however, legitimate software designed to eliminate malware is best when it comes to such unpredictable and suspicious software. If you have completed the manual removal instructions below, you still should install automatic malware removal software to guard your virtual security henceforth. If you have more questions regarding adware removal, or if you could not delete PassWizard using our tips, you should leave us a comment below. Move to the Task Bar and click the Start button. Choose the program you wish to delete, right-click it and select Uninstall. Quick & tested solution for PassWizard removal.